Get a Wittlebee Discount Code! 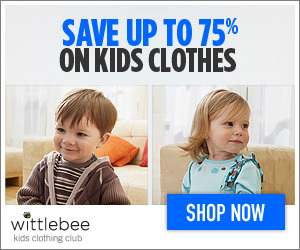 Here is another amazing deal from Wittlebee kids clothing. As regular readers will know we love the Wittlebee kids clothing boxes. Great idea, great value, great style and fabulous customer service. How Wittlebee works is that you get 6 items of kids clothing per month for an amazingly discounted price. The value of the box is around $100 but today only you can get your first box of 6 clothing items for just $29 with free shipping when you sign up today or tomorrow. The usual price is $39.99 so this is a huge saving. Each item is just $4.83! Go to Wittlebee.com and use discount code PICKEM to get your discount and your first box for just $29 with free shipping. The retail value of the box from Wittlebee is around $100 (and we have usually found it to be much higher than that). They have great quality brands in the clothing box. Wittlebee has proved to be so popular in the past they have even had a wait list – so grab this chance to get in at a discount on your first box! When you order your box you complete your style profile online. You answer some fun questions about the size, type and colors you like. You pick 3 items from the online store and Wittlebee puts together the other 3 items bearing in mind your style profile. You can even talk with a Wittlebee personal stylist if you would prefer! Hurry this expires 3/20 at midnight PST. New Amazon Baby Gear Deals! The Children’s Place: 75% Off Sale + 15% Off Coupon Code!